UPDATE: Now it actually has the outlook icon! Sorry! All those downloads and no comments! Excellent work, especially on the file format icons. This looks great but where is the Outlook icon? The preview shows an Outlook icon but there is not one in the download. Yes where is the Outlook icon ? The one that i use the most ? very nice!! Is the Outlook one around the corner? Would you be willing to make a Publisher icon. I'd greatly appreciate it! How can I load this docklet in Object Dock??? Yes, Publisher and Picture Manager would be great additions to your excelent work! File format icons for all the programs would be even nicer. 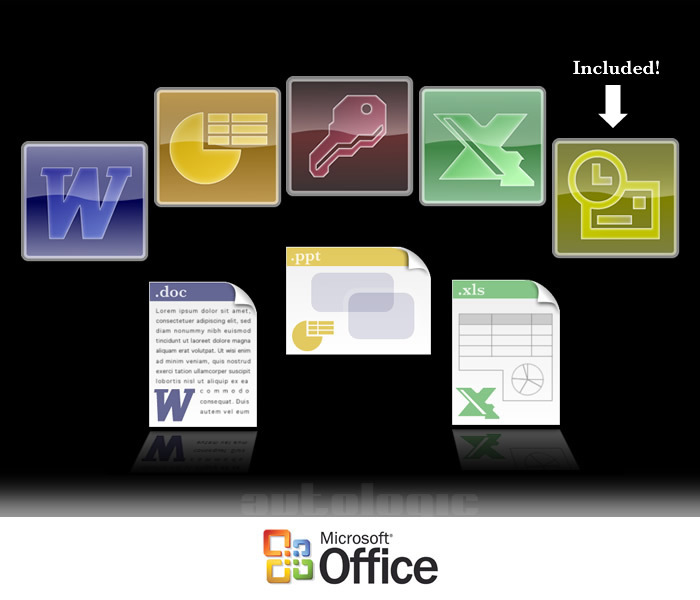 I think you should add the other program icons to this package: Frontpage, Infopath, Onenote, Project, Publisher, and Visio. This is a really nice set and I'd like to use it. However, the perfectionist in me will not allow me to use this set unless there are other, matching icons for the aforementioned other applications. Congrats on a good job, though. Keep works like this coming.